Discover how the joy of giving can make your life richer, starting today. Bestselling author Randy Alcorn introduced readers to a revolution in material freedom and radical generosity with the release of the original The Treasure Principle in 2001. Now the revision to the compact, perennial bestseller includes a provocative new concluding chapter depicting God asking a believer questions about his stewardship over material resources. Jesus spent more time talking about money and possessions than about heaven and hell combined. But too often we’ve overlooked or misunderstood his most profound teaching on this topic, from his words in Matthew 6. Jesus offers us life-changing investment advice. He actually wants us to store up treasures for ourselves—just not here on earth. Instead, he urges us to store our treasure in heaven, where they will await us, and last forever. We can’t take it with us—but we can send it on ahead! Readers are moved from the realms of thoughtful Bible exposition into the highly personal arena of everyday life. Because when Jesus told His followers to “lay up for yourselves treasures in heaven,” He intended that they discover an astounding secret: how joyful giving brings God maximum glory and His children maximum pleasure. In The Treasure Principle, you’ll unearth a radical teaching of Jesus—a secret wrapped up in giving. Once you discover this secret, life will never look the same. And you won’t want it to be. Where Are You Storing Your Treasures? Jesus spent more time talking about money and possessions than about heaven and hell combined. But too often we’ve overlooked or misunderstood his most profound teaching on this topic, from his words in Matthew 6.Far from discouraging his followers from pursuing treasure, Jesus offers us life-changing investment advice. He actually wants us to store up treasures for ourselves—just not here on earth. Instead, he urges us to store our treasure in heaven, where they will await us, and last forever. We can’t take it with us—but we can send it on ahead! The revolutionary concept of The Treasure Principle has transformed how millions view giving. This Revised and Updated edition features a new chapter plus a bonus section addressing frequently asked questions about how to live generously in everyday life. Experience for yourself how the joy of giving can make your life richer, starting today. The nearly two million people who read Randy Alcorn’s The Treasure Principle: Unlocking the Secret of Joyful Giving encountered a revolution in material freedom and generosity with the potential to utterly change their lives. Now a newly revised and updated edition of The Treasure Principle Unlocking the Secret of Joyful Giving (Multnomah, 7/18/17) is available. It features a new chapter plus a bonus section addressing frequently asked questions about how to live generously in everyday life. Alcorn, a New York Times best-selling author, notes that Jesus spent more time talking about money and possessions than about heaven and hell combined. Yet he says people have often overlooked or misunderstood his most profound teaching on this topic, from Jesus’ words in Matthew 6. Far from discouraging His followers from pursuing treasure, Jesus offers life-changing investment advice. He actually wants people to store up treasures for themselves—just not here on earth. Instead, He urges believers to store their treasures in heaven, where they will await them, and last forever. Nearly two million copies of The Treasure Principle have been sold since it was first released in 2001. The Treasure Principle DVD, containing four sessions for individuals and small groups, is also now available. Before starting EPM in 1990, Randy served as a pastor for 14 years. He has a Bachelor of Theology and Master of Arts in Biblical Studies from Multnomah University and an Honorary Doctorate from Western Seminary in Portland, Oregon and has taught on the adjunct faculties of both. 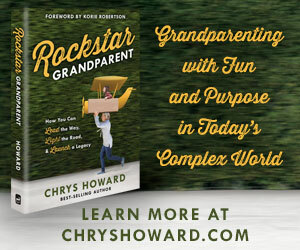 A New York Times best-selling author of over 50 books, including Heaven (over one million sold), The Treasure Principle (over two million sold), If God Is Good, Happiness and the award-winning novel Safely Home. His books sold exceed 10 million copies and have been translated into over 70 languages. Randy has written for many magazines including EPM’s issues-oriented magazine Eternal Perspectives. He has been a guest on more than 700 media programs including Focus on the Family, FamilyLife Today, In the Market with Janet Parshall and Revive Our Hearts. Randy resides in Gresham, Oregon, with his wife and best friend, Nanci. They have two married daughters and five grandsons. Randy enjoys hanging out with his family, biking, underwater photography, research, and reading. For more information, visit epm.org.